WhatsApp is one of the most popular communicator nowadays.It has became alternative of SMS.People are using it to communicate with each other and share stuffs with each other.With rise in popularity of WhatsApp it is important for Blogger to tap WhatsApp for traffic. You can expect better click through rate on content shared on WhatsApp.WhatsApp is very specific sharing platform.One person shares content with other known person or group of closely known individuals.Since the content comes with trusted and known individuals the click rate on the content is good. The best way to tap potential of WhatsApp is to add WhatsApp share button on your website.Similar to other social networking buttons share button will make sharing easy for visitors.There are multiple ways you can put WhatsApp share button on your website. I have outlined ways to put WhatsApp share button on WordPress,Joomla,Drupal and websites powered by other technologies below.Using the method mentioned below you can also track visits received from WhatsApp.You can decide whether to use the button or not on your website seeing the performance of it over a period of time. It is worth mentioning that mobile traffic is increasing with time. Your website may have 40% or more traffic from Mobile. So using a sharing button of most popular platform will be beneficial. WhatsApp does not have limitation on type of content it is used to share. People can share any type of content on it. For example if you are programmer then you can share articles related to it with your friends. Chances are that some of your friends will also be programmer or similar job profile.Similarly if you are preparing for job then you will have group of job seekers. So WhatsApp is good fit to share all type of content. I will start with generic method. The generic method will work for all websites. I would recommend using this method. The reason is you do not have to add extra code. The code is best for performance as well. So even if you are using frameworks like WordPress or Joomla I would recommend this approach. This one involves easy code changes. If you are not comfortable making code changes you can skip this section and move to next section. Next section shows how you can add the WhatsApp share button using plugins. Note this method helps you track WhatsApp share button usage in Google Analytics.The plugins method mentioned later in this article does not have this feature. Upload the File to your Server. For example if you are using WordPress then upload it to your theme inside themes folder (wp-content/themes/your-theme/). In fact you can upload it to any folder but uploading theme folder helps you find it easily. Now add below code in your website code. For example if you are using WordPress then add below code to footer.php. In footer.php locate for </body> tag. Add below code before this closing tag. Note if above code you have to modify s.src line. The line is URL to JS file you downloaded in first step. You have to replace the URL with yours. Above URL is created with WordPress users in mind. If you are WordPress user replace your-domain and your-theme with values as per your website. Once above changes are made you can copy the code to footer.php.Non WordPress users can copy the code to file or place just above </body> tag. Now it is time to add WhatsApp button on your site. You should paste below code where you want to display the button. You should replace the text ( Text you want to share) with something relevant to your website. You can also use some placeholder like Awesome website or article you must read. Personally I set data-href to home page. But you can either set it or ignore all together. You can now clear your cache and visit the site on mobile. You can try sharing your content on WhatsApp. The button will work fine if everything was implemented correctly. You can also see usage of button under Google Analytics. On Google Analytics Dashboard navigate to Events sub menu under Behavior menu. On the Page displayed click on Event Label. Number of events with Event Label WhatsAppShare shows shares made by this button. The easiest way to put the share button on your website is to use this free plugin.The plugin is present in WordPress repository and can be installed like any other plugin. Note this plugin is not updated in over couple of years. But it still works fine. You can use it without any issues. 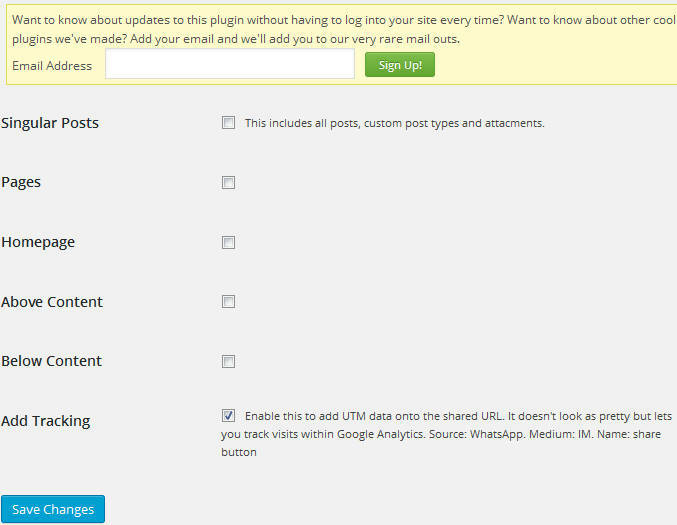 There are several new plugins but this one provides option to track the visits in Google Analytics. Below is the configuration (settings screen) of the plugin.The plugin also provides shortcode.So you can place the button at your preferred location. You can also tracks visits your website received from content shared using WhatsApp share button.This will give you some insight about traffic received because of the share button.I have used the plugin on this very website.It works fine.Also I did see decent traffic from WhatsApp as source. The plugin displays WhatsApp share button to only mobile traffic.Your desktop visitors will not see the button.So to test whether the button is rendered correctly you will have to browse your website using mobile device.Do not forget to clear your cache before browsing the website. Drupal also has free plugin to place WhatsApp share button.You can use this free drupal module to add the button on your website.Currently there is only one plugin for this purpose. Drupal plugin does not offer tracking the traffic generated from the button nor the button usage data.But you can customize it to include code mentioned in first step.That will help you gather button usage data in Google Analytics. Joomla developers have also came up with plugin for this purpose.But as of now there is no free plugin for this purpose.You will have to pay money.Either you can download any of the paid ones or you can follow the step mentioned in first step of the post. I have not used paid plugins so unable to recommend which one to use.Joomla users can use solution mentioned in first step. Feel free to share your questions or issues faced.Consider sharing this post in case you found it useful. Previous Previous post: Flipkart Affiliate Program review Should you use it? 15 comments How to add WhatsApp share button to your website? We provide WhatsApp API for Integration with Various software integrations like tally integration & integration with various CRMs. You can use this API to send automated messages through your existing system. This is simple. We are using whatsapp share button in both desktop and mobile versions in our website http://www.codeforce.com/jobportal/ 9for your reference). You can use the below code to implement it on your websites too. What harm do you see in above code? How can I trust a code, including “data:image/svg+xml;base64” ?!? I will debug it, and if it turns out to be either harmful, or invasive, you will see hell on Earth ! Thanks Esha, can we search to find out how beneficial this Whatsapp share botton on desktop websites will be? So does it mean that apart from mobile websites, there’s yet NO APP for sharing from desktop website to WhatsApp? Not existing yet? I am looking for desktop to WhatsApp share button, please anyone? is it possible to share image on whatsapp from a website? Thank you. I will try that and come back here with what I get. ww43 whatsapp-sharing com/ – link is dead. I want to place on my website which I am developing in ASP.NET MVC 4.